The go kart is very nice my granddaughter loves it. It was priced very well. Shipping and packaging was great. The go-cart is well worth the price. Its great for my kids and me too. No problems so far. It's great! Fast shipping and packaged to withstand the shipping companies. Easy to finish assembly. My go-gart has been reliable. My kids drive it all the time. We live in the country and don't have a smooth yard. It takes the punishment and hasn't failed to start yet. and the suspension really works good. Order Online. This is the 3rd Kart bought from you guys, keep up the good work! Next time if you have colorful gloves and goggles, the kids will be happier, my daughter loves pink. Seems to be a well made go kart. Took it out of the crate, added some fuel and it started right up. Has nice disc brake on the rear and looks pretty cool!! 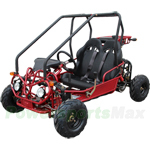 Powersportsmax was very easy to deal with and shipped the go kart quickly. Great Go Cart. Well satisfied with the 110cc go cart. Shipping was speedy and great sales people. i would like you know that this is the best money i have spent dollar for dollar.i would put my name on this product. after driving it (gk-f015) this is all you will ever need speed combind with handling and comfort it can't be beat. there is no other for this price and quality. four people i know are going to order with in the next few months. i believe this is the ultament hill ride. take it from someone that knows. So worth it. Your kids will will love getting spins around the block and dare I say, being able to drive it themselves, though it says right on the box that it is only for those kids. Much more fun than a regular go-kart! I am impressed with the cart and the service I received. This cart was for my 12 year old daughter for birthday. I ordered one from another company in September and never received it. I ordered this one in September and received it in about 11 days. It was relatively easy to assemble and my daughter has been having a blast riding it around the yard. I put it together and hit the key and it started right away and my daughter drove it out of the garage and kept on going. I am also impressed with the stability of the machine. It handles well. I have ridden it myself and it is comfortable for an adult as well. I would recommend this cart to anyone who wants a good quality cart for both kids and adults.